Brandi Hephner LaBanc (left), UM vice chancellor for student affairs, Elizabeth Milhous, director of parent development, and Daniel Ross, UPD officer, get a look at a new motorcycle donated to UPD by the Parents Council. Since 24 families from eight states founded the Ole Miss Parents Council in 2012, the organization’s work and support has already enhanced five areas at the University of Mississippi through gifts totaling $25,000. Initiatives receiving contributions from the Parents Council were the new Ole Miss Food Pantry, $5,000 in startup funds; the military student support specialist to support veterans enrolling at the university, $7,000 for furniture and technology; Southeastern Conference annual recruitment tour scheduled this spring in the Northeast, $2,700; Student Affairs marketing materials, $4,000; and a new motorcycle for the University Police Department, $6,300. “We are very blessed to be a part of the Parents Council,” said Karen Goodall of Gallatin, Tenn. “It has been a wonderful first year for (my husband) Bob and me. As a group, we were able to give funds to many worthy causes, including a motorcycle for the University Police Department. The purpose of the Parents Council is to encourage communication between the university and parents to improve the Ole Miss experience for students and their parents, said Elizabeth Milhous, director of parent development. Council members provide advice and guidance to the Division of Student Affairs and University Development on programs related to parents. The council members serve as liaisons between the university and parents as well as effective advocates for Ole Miss. The Parents Council raised $25,000 within its first six months of existence and met with Brandi Hephner LaBanc, vice chancellor for student affairs, who presented the Division of Student Affairs’ list of initiatives and needs for possible funding. Council members had an opportunity to ask questions and discuss each initiative. 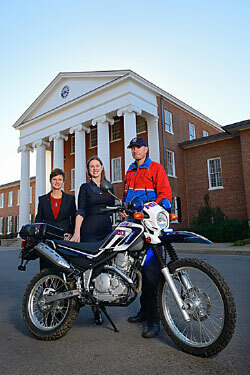 The motorcycle, for example, will help UPD in its work across the Oxford campus. Ole Miss was ranked the safest university in the Southeastern Conference and in the top 10 nationally by CollegeSafe.com in 2012. The Parents Council’s first gift to the university came from membership fees and other donations. This spring, the Parents Council will meet to distribute money raised from a Parents Campaign phonathon. To learn more information about the Ole Miss Parents Council or to receive a brochure, contact Elizabeth Milhous, director of parent development, at milhous@olemiss.edu or 662-915-3181.